This is a ground breaking analysis of the "Song of Deborah" through a comparative study of heroic poetry that elucidates the otherwise enigmatic role of Yahweh.The so-called "Song of Deborah" celebrates a decisive victory during the era of the Judges, and praises Jael and the Israelites for their defeat of a Canaanite coalition led by Sisera. Despite generations of scholarship, virtually every aspect of the poem remains disputed because it has been misunderstood in previous research. This study explains both the enigmatic role of Yahweh of the poem and its heroic ethos through a comparative study of heroic poetry.Over the last 30 years this pioneering series has established an unrivalled reputation for cutting-edge international scholarship in Biblical Studies and has attracted leading authors and editors in the field. The series takes many original and creative approaches to its subjects, including innovative work from historical and theological perspectives, social-scientific and literary theory, and more recent developments in cultural studies and reception history. \"tell Me, O Muse\" by Charles L Echols was published by Bloomsbury Publishing Plc in May 2008. 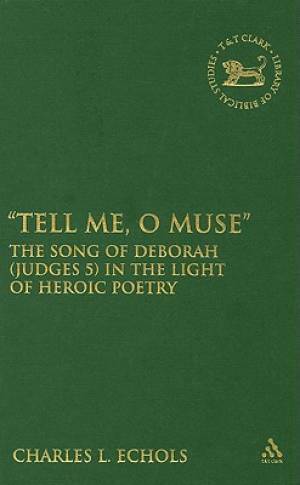 The ISBN for \"tell Me, O Muse\" is 9780567026941. Reviews of \"tell Me, O Muse\"
Be the first to review \"tell Me, O Muse\"! Got a question? No problem! Just click here to ask us about \"tell Me, O Muse\". Details for \"tell Me, O Muse\"